Well, it's that time of year again......... Football season!!! I've never been much of a football fan, but I do love all the tasty food and fun that surrounds the big game. I guess you can say when it comes to football, it's all about the food for me. I have so much fun planning and preparing all the yummy food that everyone will be eating including me! 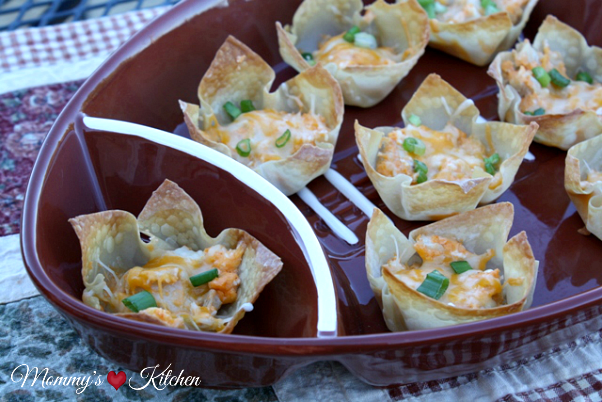 Whether you're hosting a party for the big game or attending a get-together at a friend's house, these easy Buffalo Chicken Cups are perfect to feed any hungry crowd. 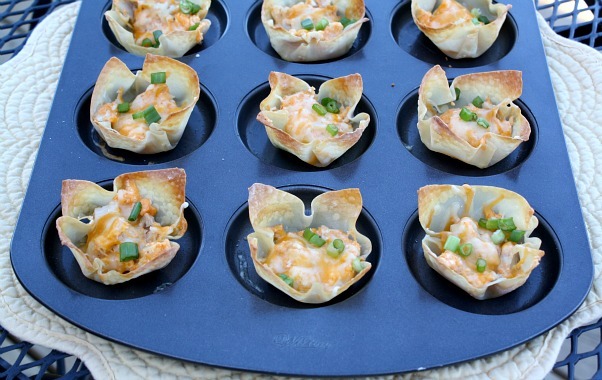 These bite size appetizers start with baked won ton cups that are filled with a buffalo chicken mixture, and topped with shredded cheese and green onions. I recommend doubling the recipe because once everyone gets a taste they'll be coming back for seconds and thirds. 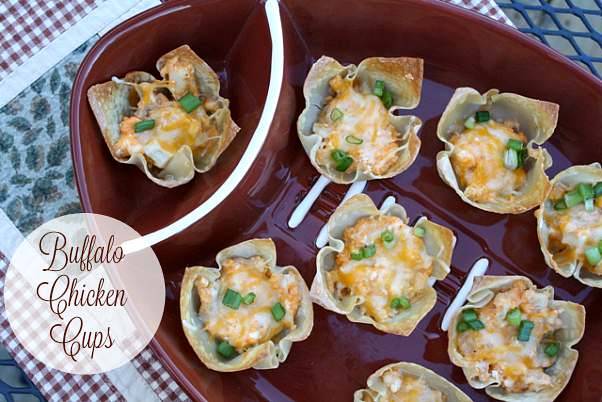 These yummy won tons have just enough kick, but are not overly spicy at all. The combination of the cream cheese and bleu cheese dressing balance out the hot sauce perfectly. To make this recipe even simpler I used a Rotisserie chicken that I picked up from my local Walmart for $4.98. 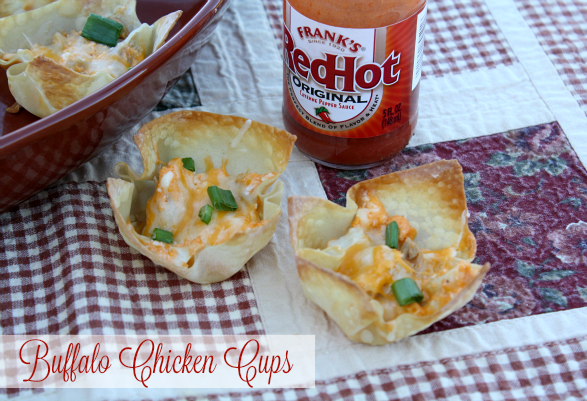 I planned on using it in a chili recipe, so I ended up with just enough leftover chicken to make these delicious buffalo chicken cups. I'm known for getting 2 meals out of 1 Rotisserie chicken, so this was a win win for me. Let's get started on the step-by-step for this easy appetizer. Start by preheating the oven to 350 degrees. Lightly spray a 12 cup muffin tray with non stick spray. Add one won ton wrapper to each muffin cup, making sure to press down on the sides and bottom to form a cup. Bake 5 minutes or until slightly golden brown. Remove from oven: set aside. In a medium size bowl, add the cream cheese, dressing, and hot sauce; mix until blended. Add the chicken and one cup of shredded cheese; mix to combine. 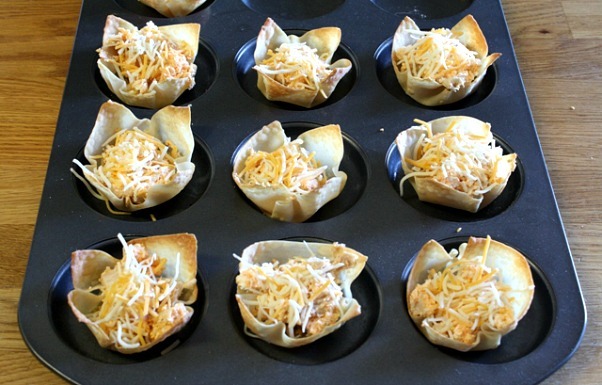 Fill each muffin cup with about one tablespoon of the buffalo chicken mixture and top with additional shredded Mexican cheese. Bake for 5-9 minutes or until cheese is melted and the mixture is warmed though. Top with chopped green onions before serving. If you're pressed for time, and can't prepare something for the big game no problem. Walmart is your one stop shop for all your game time needs. 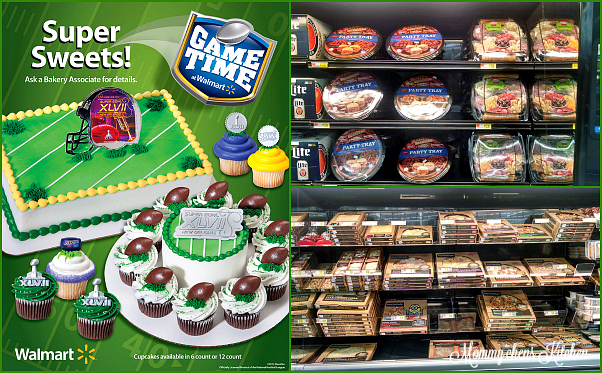 Stop by the deli and bakery department at your local Walmart for a selection of game day food options. Grab a Hormel Meat & Cheese Tray or pick up a few affordable and fresh Marketside Pizzas for your hungry football fans. Everyone loves dessert and there is plenty to choose from with, football themed cakes, cookies or cupcakes. For more football and tailgating ideas, check out the Walmart Game Time page to view their fantastic play book of game day recipes & ideas. Preheat oven to 350 degrees. Lightly spray a 12 cup muffin tray with non stick spray. I will be making these for game day. Can't wait to try them. They sound delicious and easy too. They really are super simple to make. 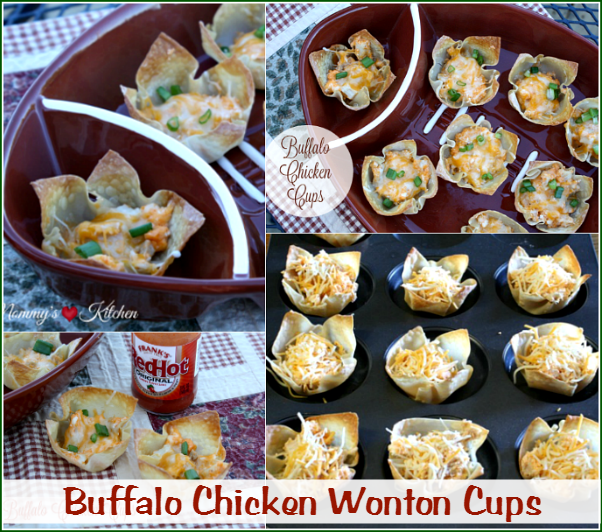 It's amazing all the recipes you can make with won ton cups.